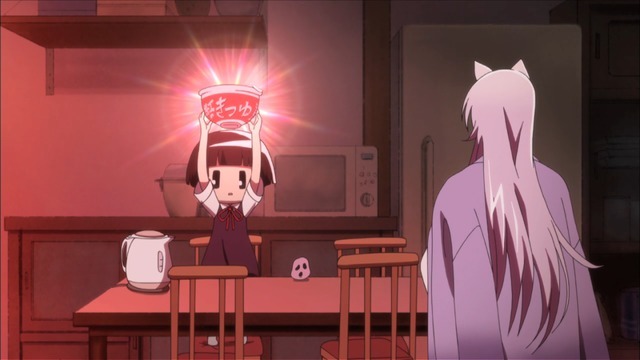 I could go for some instant udon right about now. I've already dropped Gugure! Kokkuri-san! and Girlfriend (Kari). Neither show was particularly bad, but there are plenty of other shows airing this season that are more interesting. Kokkuri is amusing enough, I suppose, but it didn't resonate with me. I can't imagine following its antics week after week. I suspect most people will be able to determine whether or not it will appeal to them simply from a synopsis alone. I like that she's sobbing as she eats. Girlfriend (Kari), on the other hand, is one of those shows that appears "objectively terrible" from the description—one that is only worth watching for its massive crush of seiyuu in its huge cast. 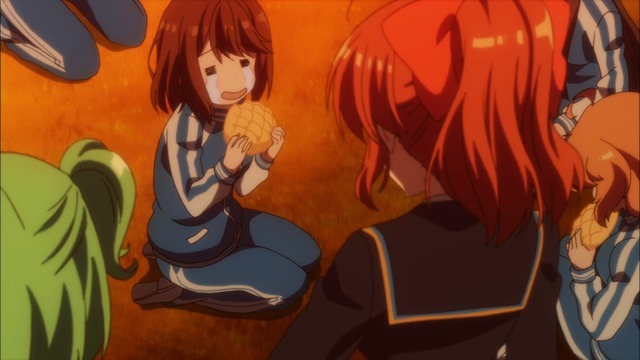 It turns out Girlfriend (Kari) (or Girl Friend BETA, whatever), is inoffensive and sort of cute in a banal way that probably appeals a lot more to people who really enjoy "Cute Girls Doing Cute Things" than I do. As it is, I still find it rather dull and I'm too uninterested to continue watching. I'm going to need something more than simply Sakura Tange talking all fucked up each week to keep me engaged.